In Russia, New Year celebration is huge! 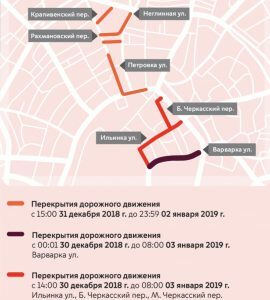 And it also means some of the roads in the center will be closed. We bring you here info when and where. 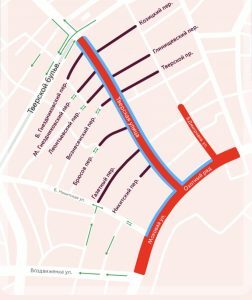 But our warmest recommendation is to stick to metro these days, since the streets will be closed for more than one day. Metro is the best choice, and during New Years night will be working all through the night. 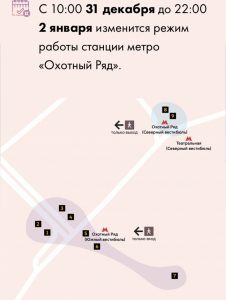 You only need to take into account that Okhotny Ryad station will on north side, next to Teatralnaya station, be only used for exit and on south side for entrance. 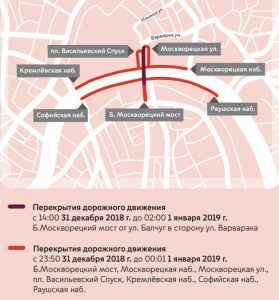 For cars, most of the center around Red Square will be closed from 29th December till 4th of January, please check pictures below for more details. In the end, try to enjoy New Year in Moscow, but stay away from cars and taxis ❄️☃️?! « Skating as it used to be!